‘People won’t be people when their hear this sound‘ – why thank you Mr. Braxton, I couldn’t have summed up this episode of A Scene In Retrospect‘s subject myself! Mirrored by New York avant-garde band Battles is every bit as engaging as it is completely and utterly perplexing, which I guess is why it’s regarded as one of the seminal records in rock music (take that term with a grain of salt, everyone who has yet to check out the album; you’ll find out why soon enough) of the last decade. Below you will find the thoughts of four Everything Is Noise members – PR/social media manager Inter and staff writers Tim, Billie, and Robert – on this towering musical achievement. Please enjoy! 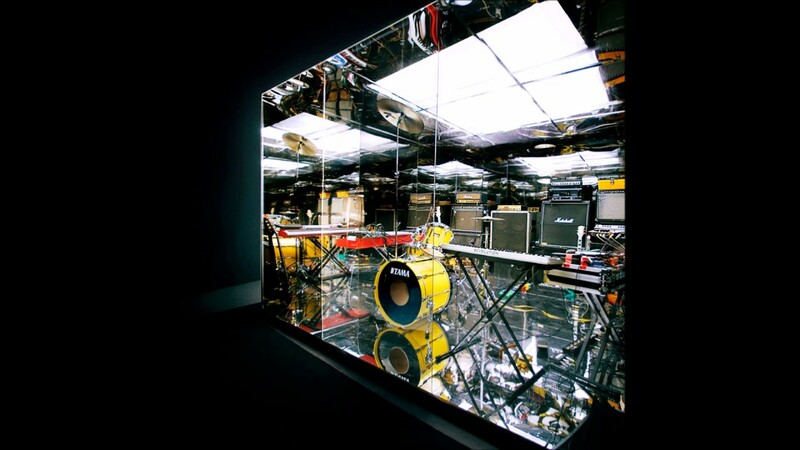 Battles’ debut full-length album, Mirrored, definitely brought an intriguing twist into the niche segment of the rock paradigm. While it was released some twelve years ago, I must say it didn’t age well, because it didn’t age at all; one wouldn’t suspect so, listening to it in the present time. All these things aren’t necessarily surprising in any way, considering the line-up of the band. Ian Williams has played guitar in Don Caballero for nearly a decade. John Stanier did drums for Helmet in their early years, as well as for Mark of Cain and Tomahawk. While Tyondai Braxton and Dave Konopka don’t have such impressive resumés, they inarguably live up to the bar that is being set. The first three tracks ease the listener into the weirdly repetitive yet ever-changing style of music Mirrored is fleshing out; here we also notice a departure from the bands’ debut material, in the form of an actual voice that’s singing. Of course, the vocals act more like just another line in the mix rather than a point of emphasis or drive – as is so common in the mathy area of things. Braxton delivers his lines in a vaguely similar fashion to how Paul Masvidal would, albeit in a more rhythmic and robotic way, which – oddly enough – complements the rest of the mix quite well. “Tonto” slightly strays away from the path that has been laid down into a minimalistic droning vibe, kind of like an intermission to be honest, considering that “Leyendecker” heads into a more post-oriented timbre. The band truly deserve their ‘experimental’ tag, as we’re greeted with influences from across entire spectrums of music which are all spun together elegantly, considering the eclectic backbone of this record. “Rainbow” and “Bad Trials” are quite easily the highlights of this album, bringing a more dynamic feel to the mix along with some very welcome grooves. The final tracks, more or less, reiterate some of the already explored elements adding something new every step of the way, even with a jazzy tinge right near the end. Mirrored is an unquestionable rock gem of the past decade, therefore I rate it √144/ln(8104). New York, 2003, a melting pot of influences and cultures. Around this time, Battles was willed into existence. But what is Battles? After listening to their 2007 album Mirrored for three hours, I can finally say…that I have no clue either. Post-math-electronic-prog rock might fit, although even that is a bit too simple when thinking about this band. When talking about experimental music, Battles should be at the top of the list, changing styles constantly and just being the perfect example for the word ‘unclassifiable’. One of my favorite songs on Mirrored, “Atlas”, starts with an upbeat drum beat and a metallic-sounding guitar that could also fit perfectly in a garage rock track. But then the vocals come in and everything changes. Pitched up an octave and with a light phaser sound to them, they sound almost disturbing in their abstract, serious chants. Electronica elements amalgamate as the track progresses, providing a stark contrast between the more organic-sounding instruments and the synthetic textures used. Shortly after the midway point of the track, a staccato sub bass dances around in a strange duet with the guitar, both slowly spiraling out of control. To explain what is going on in a Battles’ track is the same as imagining a new color or thinking about pi too much: afterwards, your brain is mud. Another favorite of mine, “Square Hanger”, is a lot shorter, yet not any less intriguing. It features slightly out-of-time drumming, euphoric guitar riffs in odd meters, and synths that pulsate, convulse, and shriek all over the track. Although it’s only two minutes long, the track stands out as an almost orchestral interlude in the magnum opus of strange music that is Mirrored. Drum samples are sped up so their pitch shifts in chromatic intervals, while the LFO-heavy synth couldn’t care less about structure or melodicism. These and a lot of even stranger songs you can hear on this record. It elegantly walks the thin line between absolute madness and absolute creativity, while being authentic and up in-your-face the whole time. When people ask me for music recommendations that are ‘weird’, Mirrored is one of the first things I send them, because the truth is that this album is super weird. The first time I heard Battles I was completely taken aback. It was unlike anything I had ever heard in my life. But the reason it is what I send people is because despite being incredibly weird, it is stillamazing. I was shown this album by a friend when I was in high school. He was leading me down a musical path, showing me all kinds of crazy stuff I had never heard of. Battles is one of the things that stuck the most and that I still go back to. I’ll never forget seeing the music video for “Tonto” for the first time. As cool as the visuals were, I couldn’t shake the music. The robotic voice effects and robust soundscapes Battles are so great at creating were mesmerizing. Looking up the lyrics to “Atlas” and actually being able to hear those words through the distortion was immense. It was my first venture into really any kind of experimental music, and opened my mind up to a whole new world of sounds. There is so much to love in all this craziness. It was relentless in its pursuit to show me more and more diversity, and by the time “Race : Out” ended, my tastes had completely evolved. Mirrored is a great album; it’s probably still my favorite experimental album to this day. But more than I love the music, I love the memories this record brings back, memories of old friends and good times we shared trying to dissect the many layers and movements of this album. It is honestly one of the albums I attribute most to my love of music. Battles took me from enjoying listening to music to enjoying the dissection of music as a continually moving piece of art. And that is exactly what Mirrored is. Talking about Battles‘ first album Mirrored is not only a statement about one of my favorite albums of all times, it’s also a critical turning point for me as a music enthusiast, since this particular band was crucial in my journey to branch out. In the end, I just followed their lead, opening up beyond restrictions and simply doing what I love. And that’s how Mirrored feels all the time: a bunch of friends doing what they love, and turning music upside down along the way. Battles were one of my very first math rock bands, and they paved the way for more mathy, chaotic and experimental bands. While I love the smooth, warm, and sweet vibes of indie/midwest emo influences in bands like American Football and TTNG, it was Battles who showed me what this branch of music could truly be. Mirrored is packed with weird loops, captivating soundscapes, and just the right amount of weirdness. A pinch more, and this all would be just one pretentious mess being weird for the sake of being weird, but the band hit the right spots to manouver themselves through wild structures and their own sense of musical architecture and composition without ever slowing down or holding back. That they still managed to make their music fun, easy, and comforting is a miracle to me, on I’m still trying to unravel. Every song on the album has so much personality and flair, while never losing out on the cohesiveness which made the album so enjoyable to listen to it in its entirety. Every time I hit play, I experience great 52 minutes. If you never heard a Battles album, this should be your starting point; you’ll never regret it! Cut! That’s a wrap, everybody! We certainly enjoyed looking back on this particular record for this ASIR article, and hopefully you felt the same way. If you want, you can leave your own thoughts on/experiences with this record in the comments; while you’re there, you can also suggest some records you feel we should include in this feature. Next PostJudiciary - "Surface Noise"